My poor greenhouse got smashed up right before Christmas 2012. I had made it out of 3/4" PVC and it proved quite rugged, standing stalwartly through 30-40 mph winds without a problem. I had specifically picked out thick walled PVC for the extra UV protection, and the pipes themselves are still as flexible and sturdy as the day I bought them. The connectors, on the other hand, well I didn't think about the connectors. Over the last year, the UV light weakened them to the point I could snap one in my hands. So, on a blustery day in December, one joint finally gave and the whole thing came tumbling down. 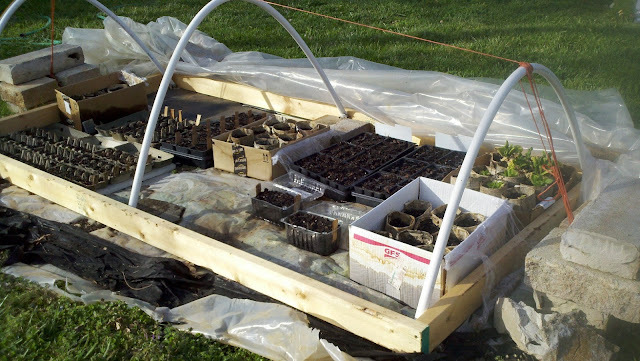 The next greenhouse will be timber-frame, but in the mean-time I cobbled together a cold frame to start some seedlings this year. Unfortunately, it doesn't hold much heat, so while the seedlings are finally starting to pop through, it's August. The direct planting seeds will overtake the seedlings in no time. Oh well, at least I have spares in case the cutworms take out the ones in the garden. I tried using paper egg cartons this year for starting flowers, and it works really well (so far). 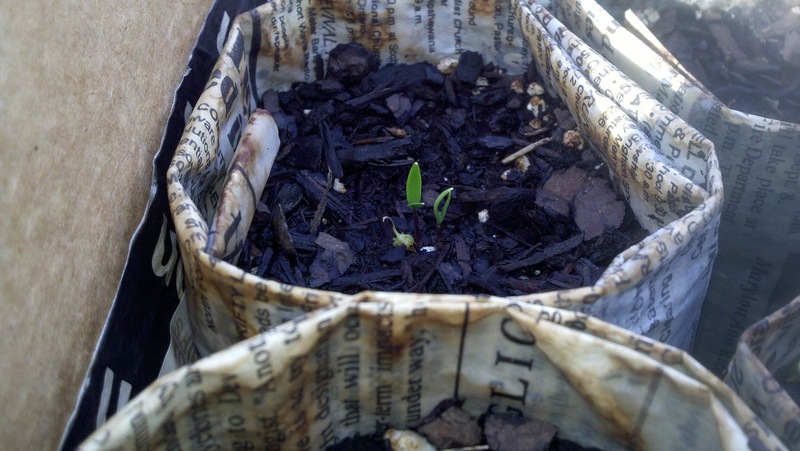 I also tried my hand at rolling newspaper into seedling pots, and those have been terrific. There's a lot more room for soil (and thereby roots), so my tomatoes, peppers, and the like can sit safely in the cold frame until planting time. Also, when putting them into the ground, there's no need to remove the seedlings from the "pots". Just poke a few holes in the sides and bottom and plant the whole thing. Hopefully the new greenhouse will be built (and still be standing) by Christmas. I hope to have a little rocket-stove inside to provide a little heat. Maybe by next April, I'll have well established plants ready to go into the garden instead of baby seedlings. Still, it's fun no matter the outcome.